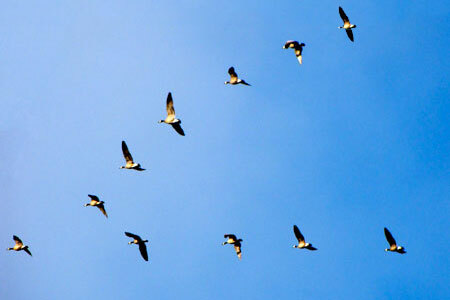 Migrating geese can actually teach us a lot about effective leadership and true teamwork. I always marvel at migrating geese each fall and spring. How do they always know where they are going? How do they fly in such a tight formation? Honking as they go, they all seem so spirited and energized. How can I get my team to consistently do the same thing? In “Lessons From Geese,” Dr. Robert McNeish, a science teacher from Baltimore describes what migrating geese can teach us about leadership and teamwork. For example, did you know that geese fly in a V formation to create an uplift that together increases their flying range? In business, team members that share a strong sense of community can reach company goals more quickly. This is where a company’s culture really supports the type of teamwork that gets excellent results. Another example: When the lead goose tires, another takes its place. And when a goose is sick, two other geese from the team follow it down until it can fly again. In a true team environment, other staff members share the burden of leading or accomplishing the more difficult tasks, when necessary. This is where cross training of team members becomes so important. In addition, as company and personal lives merge, small businesses have the responsibility to care for their employees even when they are sick. This is done through reasonable time off for illness and short term disability policies.